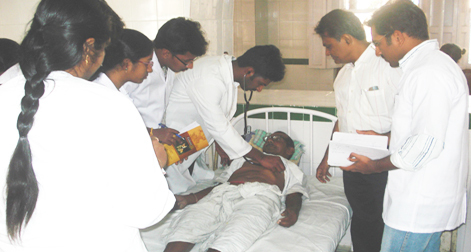 As usual, we are coming up with clinical training program in Hyderabad and also in Kolkata for 2005 & 2006 batch students during the vacation in (July - August 2009). The review program will have clinical exposure in terms of visits to the hospitals and classroom teaching by eminent practicing doctors & professors. Morning session will comprise of three hours Clinical Teaching Indoor and Outdoor in Medicine & Surgery. After noon session will be classroom teaching by senior teachers followed by Group discussion on the cases seen in the morning. The program will be started in Hyderabad on 27th July 2009 and in Kolkata on 3rd August 2009.